On August 1st, Sage 300 2018 was released featuring a collection of usability enhancements along with a brand new version of the desktop and modernization of screens and technology throughout the product. Here's a look at some of the top new features in this newest version of the software. A cornerstone enhancement in 2018, visual updates to the Sage 300 Classic screens and desktop give this version a fresh, modern look. But more than just window dressing, the new screens, buttons, and visual process flows make information and tasks more accessible. In addition, tools and controls on the desktop now appear on a ribbon (instead of menus and a toolbar) which makes the interface more consistent with other applications you may be using like Microsoft Office. According to a survey that Sage conducted in 2017, accounts payable automation was the most requested new functionality. That’s probably why they introduced Sage AP Automation which is available to Sage 300c customers beginning with the 2018 release. Sage AP Automation is designed to simplify and remove manual tasks from your entire accounts payable process, from purchase to payment. Invoices enter your Sage 300c system with guaranteed accuracy and are stored securely in the cloud, saving time and removing the complexity from manual data entry. Contact us for more product details or to see a demo. Easier Login - many customers run 3rd party products that integrate with Sage 300. New OAuth technology removes the hassle of managing multiple login credentials for multiple products. 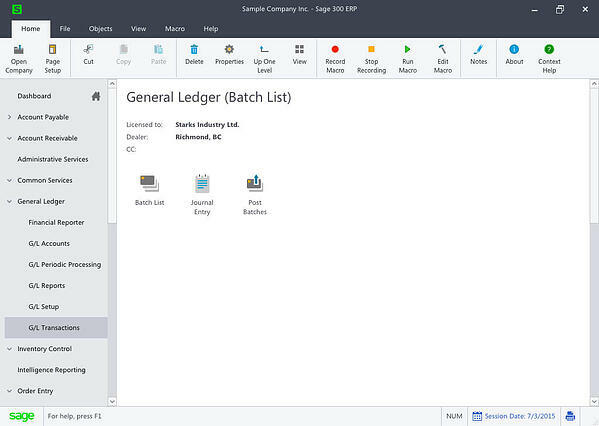 More Intelligent Reporting - Sage Intelligence Reporting Cloud for Sage 300c now features custom folders and additional parameters that make reporting even better and more powerful. Upgrade Note - Sage 300 2018 only supports upgrades from versions 5.6, 6.0, 2012, 2014, 2016, or 2017.